Ser hon inte fin ut med de vackra blommorna? Jag deltar i följande utmaningar: Cheerful Sketches, Dies R Us (Scallops), Creative Card Crew (Use a die cut), Lil' Patch (ATG), Sami Stamps (Pearls/Beads), ABC (E is for Everything) och Crafty Sentiments (Lace/pearls). Oh Jessi this is just adorable! Great coloring ... love the zig-zag scallops! Thanks so much for playing in our ‘Scallops’ challenge at Dies R Us! Please come back again soon! Such a lovely card, Jessi! Beautiful colors and coloring. Love the chevron design and scalloped edge. Thanks for joining the Dies R Us "Scallop" Challenge. Tyylikäs lyyli ja tyylikäs kortti! So soft and springy. Love this image colored in the blue and yellow combo, really gorgeous. Thanks for playing along with our challenge at Sami Stamps. I love the colors and pattern! Very cute card! 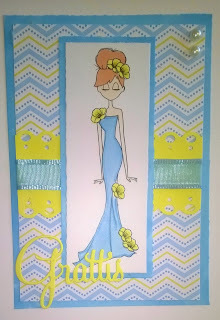 I am loving this spring creation! The image is beautiful. Thank you so much for joining us for our challenge over at Lil Patch of Crafty Friends!! Sweet card with lovely colors. Thanx for joining us at our Crafty Sentiments Desings challenge. Very nice, thanks for joining us at Cheerful. Yhanks for joinig us at Cheerful Sketches! Great card with that elegant lady. Thanks for using the sketch of CHeerful Sketches! Lovely card! Thank you very much for joining our challenge at ABC challenges. Thank you, I just took you up on your kind suggestion! Your card is just lovely Jessi. Love the image and also love your colour scheme. Thanks for playing along with us at Lil' Patch of Crafty Friends. Sorry I'm late visiting, but better late than never, right! !